While the phone itself may look different, it has many of the same features as the original Xoom, so don’t expect too much in the way of upgrades. However, the key new addition is the excellent MotoCast, which streams music and video. The handset is lightweight and nice to hold, while its angled edges lend an industrial design feel and are reminiscent of the RAZR phone. It’s hard to believe that 10 months ago there were just a handful of tablets to choose from – especially if you were after a bigger model such as the iPad. However, Motorola was the first to launch an Android tablet using the Honeycomb platform that is specially designed to be run on tablets, rather than smartphones. Now Motorola has come up with a new device to challenge Apple’s hold on the tablet market – but has it managed to come up with an iPad killer this time? The device is nice to hold in the hand – its back is flat and slightly tapered, and there are rubbery sides that make it easy to grip onto –unlike the slippery metal body of the iPad 2. With its angled corners, there’s no chance you’ll mistake the Xoom 2 for the original – or indeed for any other tablet. While the corners do have a slightly rounded edge, only the long sides of the device are straight – the shorter sides also have a slight curve to them. It does remind us of Motorola’s RAZR smartie. One thing we don’t like about the tablet is that the power button is on the back of the device – it’s closer to the edge than it was on the original and does tend to sit under the right index finger, but nevertheless we found it was far too easy to nudge the volume rocker that is positioned below it instead. What makes it even worse is that the lag between pressing the button and the screen waking up means that you can be continually hitting what you think is the power button while you’re actually altering the volume! We’d much rather see the button on the edge or preferably on the front of the device as it is on the iPad. The Xoom 2 is far lighter than its predecessor – its 130g lighter than the original at 599g – it’s even less weighty than the iPad 2. It’s also incredibly slim – measuring 8.8mm (about the same as the iPad 2). 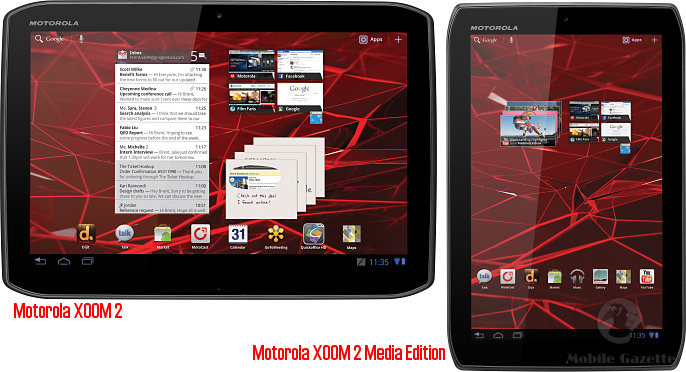 The Xoom 2 runs on the latest version of Android Honeycomb, version 3.2. This time around, Motorola has added its own stamp to the OS. However, there’s no MOTOBLUR, which was a great social networking aggregator when it was first launched but is less cutting edge now, and only features on a few new phones. The new display is claimed to be splashproof. We cautiously put this to the test – we were concerned that water could creep in through the micro USB port or 3.5mm audio jack. But we noticed that water did indeed fail to cling onto the screen. The big news on the Motorola Xoom 2 is the music, photo and video streaming service MotoCast. You can even use it to move documents from your Mac or PC to the tablet. It’s simple to set up – just attach the tablet to the computer using a USB cable and the Xoom 2 will transfer the right software onto your chosen Mac or PC. The software can also be downloaded if you prefer (or can’t find a USB cable). Create your account, choose the files you want your tablet or phone to access and you should be away. However, we encountered a couple of false starts, but once we got it working it was a simple process. Launch MotoCast and you’ll see a screen that shows all your streamable media. Hit play and your chosen file will play – it all ran smoothly. Video took a tad longer to buffer but really shone on the 10.1in display. Security-wise, this is a safe procedure because the data is streamed straight from a computer, rather being uploaded elsewhere first. Mind you, it does mean you have to have the computer turned on and online for the process to work. Should you not have your tablet or phone with you and you’re at a mate’s home, for instance, simply log on to mymotocast.com and you’ll be able to access files and music on a friend’s computer – a really handy facility. Downloading tracks is a breeze too – hit the triangle below the album art and select download. It’s that easy – but remember you only have 16GB of storage onboard. A lot has remained the same from the original Xoom – so you have the 10.1in display with 1280x800 resolution, 1Gb operating memory and a five-megapixel snapper. We’d have liked to see an improved display resolution – while at the moment its 149ppi beats the iPad 2, when Apple announces its next upgrade, the Xoom 2 might be left behind again. You also get 3D virtual surround sound. However, along with some upgrades, there are two downgrades. A 1.3-megapixel model has replaced the two-megapixel front-facing snapper and there is now no SD card slot – which means you’re lumbered with 16Gb of onboard storage. Mind you, with the streaming service of MotoCast on offer, it’s not quite the problem it could have been. On the upside, the double-core chip is now 1.2GHz (from 1GHz). This won’t make huge amounts of difference in performance although we found everything ran along quite nicely – and email and net surfing worked slightly better than on the original. The Xoom 2 runs on the latest version of Honeycomb, which works really smoothly – it’s a shame it doesn’t have the very latest version – Ice Cream Sandwich – but that will come. Of course all systems will be compared with Apple’s iOS, and while Android is less user friendly, it does have more in the way of interactions and we like the Recent Applications virtual key that sits at the bottom of the display along with the Home and Back keys. Shortcut icons are not as sleek as those on Apple’s system, but they can be placed where you want them – which is an improvement on iOS. Battery life is good and the rear camera is just as it was on the last Xoom – however, the speedier chip means that the shutter has got faster ­– although we didn’t really notice any difference in practice. While the Xoom 2 looks better than its predecessor and proves speedier in performance, we’re still bugged by that oddly placed power button. While Motorola has managed to bring the tablet’s hardware into line with the iPad, it means the software is the deciding factor. So when the Xoom 2 gets an Ice Cream Sandwich upgrade it will definitely be a far more attractive option for anyone looking to enter the tablet market.